Type I > Type II? In some respects, there is nothing to be said; in other respects, there is much to be said. “Probing the Improbable: Methodological Challenges for Risks with Low Probabilities and High Stakes” discusses a basic issue with existential threats: any useful discussion will be rigorous, hopefully with physics and math proofs; but proofs themselves are empirically unreliable. Given that proofs are the most reliable form of epistemology humans know, this sets a basic upper bound on how much confidence we can put on any belief, and given the lurking existence of systematic biases, it may even be possible for there to be too much evidence for a claim (Gunn et al 2016). There are other rare risks, from mental diseases2 to hardware errors3 to how to deal with contradictions4, but we’ll look at mathematical error. This upper bound on our certainty may force us to disregard certain rare risks because the effect of error on our estimates of existential risks is asymmetric: an error will usually reduce the risk, not increase it. The errors are not distributed in any kind of symmetrical around a mean: an existential risk is, by definition, bumping up against the upper bound on possible damage. If we were trying to estimate, say, average human height, and errors were distributed like a bell curve, then we could ignore them. But if we are calculating the risk of a super-asteroid impact which will kill all of humanity, an error which means the super-asteroid will actually kill humanity twice over is irrelevant because it’s the same thing (we can’t die twice); however, the mirror error - the super-asteroid actually killing half of humanity - matters a great deal! Strange! If we read over the works of the ancients we are tempted to class them all among the intuitionalists. And yet nature is always the same; it is hardly probable that it has begun in this century to create minds devoted to logic. If we could put ourselves into the flow of ideas which reigned in their time, we should recognize that many of the old geometers were in tendency analysts. Euclid, for example, erected a scientific structure wherein his contemporaries could find no fault. In this vast construction, of which each piece however is due to intuition, we may still to-day, without much effort, recognize the work of a logician. … What is the cause of this evolution? It is not hard to find. Intuition can not give us rigour, nor even certainty; this has been recognized more and more. Let us cite some examples. We know there exist continuous functions lacking derivatives. Nothing is more shocking to intuition than this proposition which is imposed upon us by logic. Our fathers would not have failed to say: “It is evident that every continuous function has a derivative, since every curve has a tangent.” How can intuition deceive us on this point? … I shall take as second example Dirichlet’s principle on which rest so many theorems of mathematical physics; to-day we establish it by reasonings very rigorous but very long; heretofore, on the contrary, we were content with a very summary proof. A certain integral depending on an arbitrary function can never vanish. Hence it is concluded that it must have a minimum. The flaw in this reasoning strikes us immediately, since we use the abstract term function and are familiar with all the singularities functions can present when the word is understood in the most general sense. But it would not be the same had we used concrete images, had we, for example, considered this function as an electric potential; it would have been thought legitimate to affirm that electrostatic equilibrium can be attained. Yet perhaps a physical comparison would have awakened some vague distrust. But if care had been taken to translate the reasoning into the language of geometry, intermediate between that of analysis and that of physics, doubtless this distrust would not have been produced, and perhaps one might thus, even to-day, still deceive many readers not forewarned. …A first question presents itself. Is this evolution ended? Have we finally attained absolute rigour? At each stage of the evolution our fathers also thought they had reached it. If they deceived themselves, do we not likewise cheat ourselves? We believe that in our reasonings we no longer appeal to intuition; the philosophers will tell us this is an illusion. Pure logic could never lead us to anything but tautologies; it could create nothing new; not from it alone can any science issue. In one sense these philosophers are right; to make arithmetic, as to make geometry, or to make any science, something else than pure logic is necessary. Case 2 is disturbing, since it is a case in which we wind up with false beliefs and also false beliefs about our beliefs (we no longer know that we don’t know). Case 2 could lead to extinction. Now let us shift to the other end of the spectrum, and allow me to relate another personal anecdote. In the summer of 1979, while attending a philosophy meeting in Pittsburgh, I was struck with a case of detached retinas. Thanks to Joni’s prompt intervention, I managed to be operated on in the nick of time and my eyesight was saved. On the morning after the operation, while I was lying on a hospital bed with my eyes bandaged, Joni dropped in to visit. Since I was to remain in that Pittsburgh hospital for at least a week, we decided to write a paper. Joni fished a manuscript out of my suitcase, and I mentioned to her that the text had a few mistakes which she could help me fix. There followed twenty minutes of silence while she went through the draft. “Why, it is all wrong!” she finally remarked in her youthful voice. She was right. Every statement in the manuscript had something wrong. Nevertheless, after laboring for a while, she managed to correct every mistake, and the paper was eventually published. 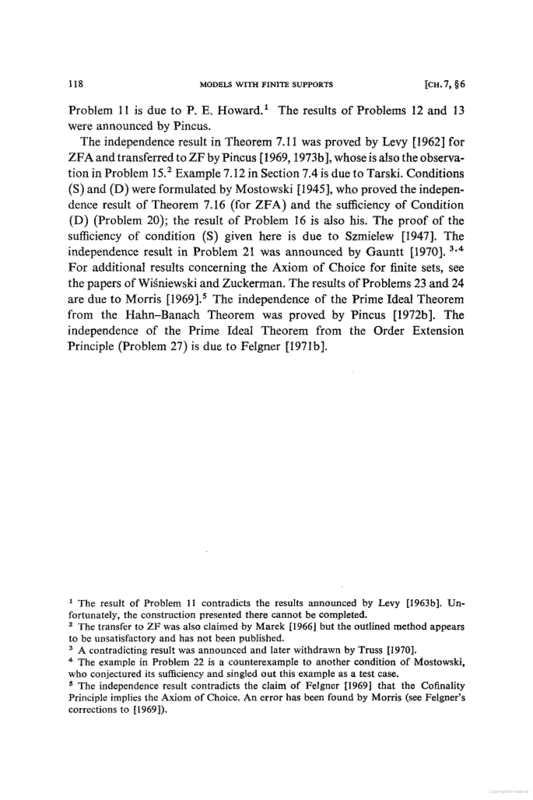 The result of Problem 11 contradicts the results announced by Levy [1963b]. Unfortunately, the construction presented there cannot be completed. The transfer to ZF was also claimed by Marek  but the outlined method appears to be unsatisfactory and has not been published. A contradicting result was announced and later withdrawn by Truss . The example in Problem 22 is a counterexample to another condition of Mostowski, who conjectured its sufficiency and singled out this example as a test case. The independence result contradicts the claim of Felgner  that the Cofinality Principle implies the Axiom of Choice. An error has been found by Morris (see Felgner’s corrections to ). Other times, the correct result is known and proven, but many are unaware of the answers16. The famous Millennium Problems - those that have been solved, anyway - have a long history of failed proofs (Fermat surely did not prove Fermat’s Last Theorem & may have realized this only after boasting17 and neither did Lindemann18). What explains this? The guiding factor that keeps popping up when mathematicians make leaps seems to go under the name of ‘elegance’ or mathematical beauty, which widely considered important192021. This imbalance suggests that mathematicians are quite correct when they say proofs are not the heart of mathematics and that they possess insight into math, a 6th sense for mathematical truth, a nose for aesthetic beauty which correlates with veracity: they disproportionately go after theorems rather than their negations. Why this is so, I do not know. Outright Platonism like Godel apparently believed in seems unlikely - mathematical expertise resembles a complex skill like chess-playing more than it does a sensory modality like vision. Possibly they have well-developed heuristics and short-cuts and they focus on the subsets of results on which those heuristics work well (the drunk searching under the spotlight), or perhaps they do run full rigorous proofs but are doing so subconsciously and merely express themselves ineptly consciously with omissions and erroneous formulations ‘left as an exercise for the reader’22. We could try to justify the heuristic paradigm by appealing to as-yet poorly understood aspects of the brain, like our visual cortex: argue that what is going on is that mathematicians are subconsciously doing tremendous amounts of computation (like we do tremendous amounts of computation in a thought as ordinary as recognizing a face), which they are unable to bring up explicitly. So after prolonged introspection and some comparatively simple explicit symbol manipulation or thought, they feel that a conjecture is true and this is due to a summary of said massive computations. Unfortunately I suspect that the connoisseurship of mathematicians for truth might be local to their domain. I have discussed with friends about how “brittle” different mathematical domains are, and our consensus is that there are definitely differences between logic, geometry and calculus. Philosophers also seem to have a good nose for what works or doesn’t in their domain, but it doesn’t seem to carry over to other domains. Now moving outside to applied domains things get even trickier. There doesn’t seem to be the same “nose for truth” in risk assessment, perhaps because it is an interdisciplinary, messy domain. The cognitive abilities that help detect correct decisions are likely local to particular domains, trained through experience and maybe talent (i.e. some conformity between neural pathways and deep properties of the domain). The only thing that remains is general-purpose intelligence, and that has its own limitations. Leslie Lamport advocates for machine-checked proofs and a more rigorous style of proofs similar to natural deduction, noting a mathematician acquaintance guesses at a broad error rate of 1/329 and that he routinely found mistakes in his own proofs and, worse, believed false conjectures30. We can probably add software to that list: early software engineering work found that, dismayingly, bug rates seem to be simply a function of lines of code, and one would expect diseconomies of scale. So one would expect that in going from the ~4,000 lines of code of the Microsoft DOS operating system kernel to the ~50,000,000 lines of code in Windows Server 2003 (with full systems of applications and libraries being even larger: the comprehensive Debian repository in 2007 contained ~323,551,126 lines of code) that the number of active bugs at any time would be… fairly large. Mathematical software is hopefully better, but practitioners still run into issues (eg Durán et al 2014, Fonseca et al 2017) and I don’t know of any research pinning down how buggy key mathematical systems like Mathematica are or how much published mathematics may be erroneous due to bugs. This general problem led to predictions of doom and spurred much research into automated proof-checking, static analysis, and functional languages31. The doom, however, did not manifest and arguably operating systems & applications are more reliable in the 2000s+ than they were in the 1980-1990s32 (eg. the general disappearance of the Blue Screen of Death). Users may not appreciate this point, but programmers who happen to think one day of just how the sausage of Gmail is made - how many interacting technologies and stacks of formats and protocols are involved - may get the shakes and wonder how it could ever work, much less be working at that moment. The answer is not really clear: it seems to be a combination of abundant computing resources driving down per-line error rates by avoiding optimization, modularization reducing interactions between lines, greater use of testing invoking an adversarial attitude to one’s code, and a light sprinkling of formal methods & static checks33. While hopeful, it’s not clear how many of these would apply to existential risks: how does one use randomized testing on theories of existential risk, or tradeoff code clarity for computing performance? The second possibility turned out to be harder to refute. In fact he was unable to derive a logical contradiction and instead derived many non-intuitive results; for example that triangles have a maximum finite area and that there is an absolute unit of length. He finally concluded that: “the hypothesis of the acute angle is absolutely false; because it is repugnant to the nature of straight lines”. Today, his results are theorems of hyperbolic geometry. Should such widely-believed conjectures as P≠NP or the Riemann hypothesis turn out be false, then because they are assumed by so many existing proofs, a far larger math holocaust would ensue38 - and our previous estimates of error rates will turn out to have been substantial underestimates. But it may be a cloud with a silver lining, if it doesn’t come at a time of danger. Proofs are indispensable, but I would say they are necessary but not sufficient for mathematical truth, at least truth as perceived by the individual. To justify this attitude let me invoke two experiences of current mathematics, which very few mathematicians today have escaped. The first is computer programming. To write a short program, say 100 lines of C code, is a relatively painless experience. The debugging will take longer than the writing, but it will not entail suicidal thoughts. However, should an inexperienced programmer undertake to write a slightly longer program, say 1000 lines, distressing results will follow. The debugging process becomes an emotional nightmare in which one will doubt one’s own sanity. One will certainly insult the compiler in words that are inappropriate for this essay. The mathematician, having gone through this torture, cannot but ask: “Have I ever subjected the proofs of any of my theorems to such close scrutiny?” In my case at least the answer is surely “no”. So while I do not doubt that my proofs are correct (at least the significant ones), my belief in the results needs bolstering. Compare this with the debugging process. At the end of debugging we are happy with our program because of the consistency of the output it gives, not because we feel we have proved it correct-after all we did that at least twenty times while debugging and we were wrong every time. Why not a twenty-first? In fact we are acutely aware that our poor program has only been tested with a limited set of inputs and we fully expect more bugs to manifest themselves when inputs are used which we have not yet considered. If the program is sufficiently important, it will be further debugged in the course of time until it becomes secure with respect to all inputs. (With much larger programs this will never happen.) So it is with our theorems. Although we may have proofs galore and a rich surrounding structure, if the result is at all difficult it is only the test of time that will cause acceptance of the “truth” of the result. Take the example of the woman discussed in Lishman’s Organic Psychiatry. After a right-hemisphere stroke, she lost movement in her left arm but continuously denied it. When the doctor asked her to move her arm, and she observed it not moving, she claimed that it wasn’t actually her arm, it was her daughter’s. Why was her daughter’s arm attached to her shoulder? The patient claimed her daughter had been there in the bed with her all week. Why was her wedding ring on her daughter’s hand? The patient said her daughter had borrowed it. Where was the patient’s arm? The patient “turned her head and searched in a bemused way over her left shoulder”…In any case, a patient who has been denying paralysis for weeks or months will, upon having cold water placed in the ear, admit to paralysis, admit to having been paralyzed the past few weeks or months, and express bewilderment at having ever denied such an obvious fact. And then the effect wears off, and the patient not only denies the paralysis but denies ever having admitted to it. This example shows that soft errors can be a realistic concern in mathematical calculations. (As added confirmation, the E8 calculation has now been repeated about 5 times with identical results.) …The soft error rate is remarkably sensitive to elevation; a calculation in Denver produces about three times more soft errors than the same calculation on identical hardware in Boston…Soft errors are depressing news in the ultra-reliable world of proof assistants. Alpha particles rain on perfect and imperfect software alike. In fact, because the number of soft errors is proportional to the execution time of a calculation, by being slow and methodical, the probability of a soft error during a calculation inside a proof assistant can be much higher than the probability when done outside. If a contradiction were now actually found in arithmetic - that would only prove that an arithmetic with such a contradiction in it could render very good service; and it would be better for us to modify our concept of the certainty required, than to say it would really not yet have been a proper arithmetic. A skeptical solution of a philosophical problem begins… by conceding that the skeptic’s negative assertions are unanswerable. Nevertheless our ordinary practice or belief is justified because-contrary appearances notwithstanding-it need not require the justification the sceptic has shown to be untenable. And much of the value of the sceptical argument consists precisely in the fact that he has shown that an ordinary practice, if it is to be defended at all, cannot be defended in a certain way. the transcendality of 2√2 and eπ: resolved as predicted, but >78 years faster than he predicted. Hilbert’s 21st problem, on the existence of linear DEs with prescribed monodromy group, was for a long time thought to have been solved by Plemelj in 1908. In fact, Plemelj died in 1967 still believing he had solved the problem. However, in 1989, Bolibruch discovered a counterexample. Details are in the book The Riemann-Hilbert Problem by Anosov and Bolibruch (Vieweg-Teubner 1994), and a nice popular recounting of the story is in Ben Yandell’s The Honors Class (A K Peters 2002). After trying to prove this for almost ten years, one day he worked on the opposite direction, and solved it in hours. That Euclid’s axiomatization does at some minor points not meet the modern requirements of absolute axiomatic rigour is of lesser importance in this respect…The first formulations of the calculus were not even mathematically rigorous. An inexact, semi-physical formulation was the only one available for over a hundred and fifty years after Newton! And yet, some of the most important advances of analysis took place during this period, against this inexact, mathematically inadequate background! Some of the leading mathematical spirits of the period were clearly not rigorous, like Euler; but others, in the main, were, like Gauss or Jacobi. The development was as confused and ambiguous as can be, and its relation to empiricism was certainly not according to our present (or Euclid’s) ideas of abstraction and rigour. Yet no mathematician would want to exclude it from the fold - that period produced mathematics as first-class as ever existed! And even after the reign of rigour was essentially re-established with Cauchy, a very peculiar relapse into semi-physical methods took place with Riemann. Of course, there are all sorts of practical issues. Newer papers are predominantly in TeX, so it’s not too difficult to pull out theorems with all their mathematical notation. But older papers need to be scanned, which requires math OCR, which has yet to be properly developed. Then there are issues like whether theorems stated in papers are actually valid. And even whether theorems that were considered valid, say, 100 years ago are still considered valid today. For example, for continued fractions, there are lots of pre-1950 theorems that were successfully proved in their time, but which ignore branch cuts, and so wouldn’t be considered correct today. And in the end of course it requires lots of actual, skilled mathematicians to guide the curation process, and to encode theorems. But in a sense this kind of mobilization of mathematicians is not completely unfamiliar; it’s something like what was needed when Zentralblatt was started in 1931, or Mathematical Reviews in 1941. The history of mathematics is full of philosophically and ethically troubling reports about bad proofs of theorems. For example, the fundamental theorem of algebra states that every polynomial of degree n with complex coefficients has exactly n complex roots. D’Alembert published a proof in 1746, and the theorem became known “D’Alembert’s theorem”, but the proof was wrong. Gauss published his first proof of the fundamental theorem in 1799, but this, too, had gaps. Gauss’s subsequent proofs, in 1816 and 1849, were OK. It seems to have been hard to determine if a proof of the fundamental theorem of algebra was correct. Why? Poincaré was awarded a prize from King Oscar II of Sweden and Norway for a paper on the three-body problem, and his paper was published in Acta Mathematica in 1890. But the published paper was not the prize-winning paper. The paper that won the prize contained serious mistakes, and Poincare and other mathematicians, most importantly, Mittag-Leffler, engaged in a conspiracy to suppress the truth and to replace the erroneous paper with an extensively altered and corrected one. Why use computers to verify mathematics? The simple answer is that carefully implemented proof checkers make fewer errors than mathematicians (except J.-P. Serre). Incorrect proofs of correct statements are so abundant that they are impossible to catalogue. Ralph Boas, former executive editor of Math Reviews, once remarked that proofs are wrong “half the time” [Aus08]. Kempe’s claimed proof of the four-color theorem stood for more than a decade before Heawood refuted it [Mac01, p. 115]. “More than a thousand false proofs [of Fermat’s Last Theorem] were published between 1908 and 1912 alone” [Cor10]. Many published theorems are like the hanging chad ballots of the 2000 U.S. presidential election, with scrawls too ambivalent for a clear yea or nay. One mathematician even proposed to me that a new journal is needed that unlike the others only publishes reliable results. Euclid gave us a method, but even he erred in the proof of the very first proposition of the Elements when he assumed without proof that two circles, each passing through the other’s center, must intersect. The concept that is needed to repair the gap in Euclid’s reasoning is an intermediate value theorem. This defect was not remedied until Hilbert’s Foundations of Geometry. Examples of widely accepted proofs of false or unprovable statements show that our methods of proof-checking are far from perfect. Lagrange thought he had a proof of the parallel postulate, but had enough doubt in his argument to withhold it from publication. In some cases, entire schools have become sloppy, such as the Italian school of algebraic geometry or real analysis before the revolution in rigor towards the end of the nineteenth century. Plemelj’s 1908 accepted solution to Hilbert’s 21st problem on the monodromy of linear differential equations was refuted in 1989 by Bolibruch. Auslander gives the example of a theorem12 published by Waraskiewicz in 1937, generalized by Choquet in 1944, then refuted with a counterexample by Bing in 1948 [Aus08]. Another example is the approximation problem for Sobolev maps between two manifolds [Bet91], which contains a faulty proof of an incorrect statement. The corrected theorem appears in [HL03]. Such examples are so plentiful that a Wiki page has been set up to classify them, with references to longer discussions at Math Overflow [Wik11], [Ove09], [Ove10]. A more recent example was the discovery that Andrew Wiles’ original proof of Fermat’s Last Theorem was flawed (but not, as it turned out, fatally flawed, as Wiles managed to fix the problem (Singh, 1997))…More recently, Larry Wos has been using Otter to find smaller proofs of theorems than the current ones. To this end, he uses Otter to find more succinct methods than those originally proposed. This often results in detecting double negations and removing unnecessary lemmas, some of which were thought to be indispensable. (Wos, 1996) presents a methodology using a strategy known as resonance to search for elegant proofs with Otter. He gives examples from mathematics and logic, and also argues that this work also implications for other fields such as circuit design. (Fleuriot & Paulson, 1998) have studied the geometric proofs in Newton’s Principia and investigated ways to prove them automatically with the Isabelle interactive theorem prover (Paulson, 1994). To do this, they formalized the Principia in both Euclidean geometry and non-standard analysis. While working through one of the key results (proposition 11 of book 1, the Kepler problem) they discovered an anomaly in the reasoning. Newton was appealing to a cross-multiplication result which wasn’t true for infinitesimals or infinite numbers. Isabelle could therefore not prove the result, but Fleuriot managed to derive an alternative proof of the theorem that the system found acceptable. Theorems that are calculations or enumerations are especially prone to error. Feynman laments, “I don’t notice in the morass of things that something, a little limit or sign, goes wrong.. . . I have mathematically proven to myself so many things that aren’t true” [Fey00, p. 885]. Elsewhere, Feynman describes two teams of physicists who carried out a two-year calculation of the electron magnetic moment and independently arrived at the same predicted value. When experiment disagreed with prediction, the discrepancy was eventually traced to an arithmetic error made by the physicists, whose calculations were not so independent as originally believed [Fey85, p. 117]. Pontryagin and Rokhlin erred in computing stable homotopy groups of spheres. Little’s tables of knots from 1885 contains duplicate entries that went undetected until 1974. In enumerative geometry, in 1848, Steiner counted 7776 plane conics tangent to 5 general plane conics, when there are actually only 3264. One of the most persistent blunders in the history of mathematics has been the misclassification (or misdefinition) of convex Archimedean polyhedra. Time and again, the pseudo rhombic cuboctahedron has been overlooked or illogically excluded from the classification (Figure 21) [Grue11]. Mathematical truths are immutable, but mathematicians do make errors, especially when carrying out non-trivial enumerations. Some of the errors are “innocent” – plain mistakes that get corrected as soon as an independent enumeration is carried out. For example, Daublebsky  in 1895 found that there are precisely 228 types of configurations (123), that is, collections of 12 lines and 12 points, each incident with three of the others. In fact, as found by Gropp  in 1990, the correct number is 229. Another example is provided by the enumeration of the uniform tilings of the 3-dimensional space by Andreini  in 1905; he claimed that there are precisely 25 types. However, as shown  in 1994, the correct number is 28. Andreini listed some tilings that should not have been included, and missed several others – but again, these are simple errors easily corrected….It is surprising how errors of this type escape detection for a long time, even though there is frequent mention of the results. One example is provided by the enumeration of 4-dimensional simple polytopes with 8 facets, by Brückner  in 1909. He replaces this enumeration by that of 3-dimensional “diagrams” that he interpreted as Schlegel diagrams of convex 4-polytopes, and claimed that the enumeration of these objects is equivalent to that of the polytopes. However, aside from several “innocent” mistakes in his enumeration, there is a fundamental error: While to all 4-polytopes correspond 3-dimensional diagrams, there is no reason to assume that every diagram arises from a polytope. At the time of Brückner’s paper, even the corresponding fact about 3-polyhedra and 2-dimensional diagrams has not yet been established – this followed only from Steinitz’s characterization of complexes that determine convex polyhedra , . In fact, in the case considered by Brückner, the assumption is not only unjustified, but actually wrong: One of Brückner’s polytopes does not exist, see . …Polyhedra have been studied since antiquity. It is, therefore, rather surprising that even concerning some of the polyhedra known since that time there is a lot of confusion, regarding both terminology and essence. But even more unexpected is the fact that many expositions of this topic commit serious mathematical and logical errors. Moreover, this happened not once or twice, but many times over the centuries, and continues to this day in many printed and electronic publications; the most recent case is in the second issue for 2008 of this journal….With our understandings and exclusions, there are fourteen convex polyhedra that satisfy the local criterion and should be called “Archimedean”, but only thirteen that satisfy the global criterion and are appropriately called “uniform” (or “semiregular”). Representatives of the thirteen uniform convex polyhedra are shown in the sources mentioned above, while the fourteenth polyhedron is illustrated in Figure 1. It satisfies the local criterion but not the global one, and therefore is - in our terminology - Archimedean but not uniform. The history of the realization that the local criterion leads to fourteen polyhedra will be discussed in the next section; it is remarkable that this development occurred only in the 20th century. This implies that prior to the twentieth century all enumerations of the polyhedra satisfying the local criterion were mistaken. Unfortunately, many later enumerations make the same error. Fermat repeatedly bragged about the n = 3 and n = 4 cases and posed them as challenges to other mathematicians … But he never mentioned the general case, n = 5 and higher, in any of his letters. Why such restraint? Most likely, Weil argues, because Fermat had realized that his “truly wonderful proof” did not work in those cases…Every mathematician has had days like this. You think you have a great insight, but then you go out for a walk, or you come back to the problem the next day, and you realize that your great idea has a flaw. Sometimes you can go back and fix it. And sometimes you can’t. Much additional progress was made over the next 150 years, but no completely general result had been obtained. Buoyed by false confidence after his proof that pi is transcendental, the mathematician Lindemann proceeded to publish several proofs of Fermat’s Last Theorem, all of them invalid (Bell 1937, pp. 464-465). A prize of 100000 German marks, known as the Wolfskehl Prize, was also offered for the first valid proof (Ball and Coxeter 1987, p. 72; Barner 1997; Hoffman 1998, pp. 193-194 and 199). A recent false alarm for a general proof was raised by Y. Miyaoka (Cipra 1988) whose proof, however, turned out to be flawed. Other attempted proofs among both professional and amateur mathematicians are discussed by vos Savant (1993), although vos Savant erroneously claims that work on the problem by Wiles (discussed below) is invalid. Einstein told the philosopher of science Hans Reichenbach that he’d known even before the solar eclipse of 1918 supported his general theory of relativity that the theory must be true because it was so beautiful. And Hermann Weyl, who worked on both relativity theory and quantum mechanics, said “My work always tried to unite the true with the beautiful, but when I had to choose one or the other, I usually chose the beautiful.”…Mathematics seems to be the one place where you don’t have to choose, where truth and beauty are always united. One of my all-time favorite books is A Mathematician’s Apology. G.H. Hardy tries to demonstrate to a general audience that mathematics is intimately about beauty. He gives as examples two proofs, one showing that the square root of 2 is irrational, the other showing that there’s no largest prime number. Simple, easily graspable proofs, that stir the soul with wonder. Many mathematicians have the opposite opinion; they do not or cannot distinguish the beauty or importance of a theorem from its proof. A theorem that is first published with a long and difficult proof is highly regarded. Someone who, preferably many years later, finds a short proof is “brilliant.” But if the short proof had been obtained in the beginning, the theorem might have been disparaged as an “easy result.” Erdős was a genius at finding brilliantly simple proofs of deep results, but, until recently, much of his work was ignored by the mathematical establishment. There is a long tradition in mathematics of describing proofs and theorems in aesthetic terms, often using words such as ‘elegance’ and ‘depth’. Further, mathematicians have also argued that their subject is more akin to an art than it is to a science (see Hardy, 1967; Littlewood, 1986; Sullivan 1925/1956), and, like the arts, ascribe to mathematics aesthetic goals. For example, the mathematician W. Krull (1930/1987) writes: “the primary goals of the mathematician are aesthetic, and not epistemological” (p. 49). This statement seems contradictory with the oft-cited concern of mathematics with finding or discovering truths, but it emphasises the fact that the mathematician’s interest is in expressing truth, and in doing so in clever, simple, succinct ways. While Krull focuses on mathematical expression, the mathematician H. Poincare (1908/1966) concerns himself with the psychology of mathematical invention, but he too underlines the aesthetic dimension of mathematics, not the logical. In Poincare’s theory, a large part of a mathematician’s work is done at the subconscious level, where an aesthetic sensibility is responsible for alerting the mathematicians to the most fruitful and interesting of ideas. Other mathematicians have spoken of this special sensibility as well and also in terms of the way it guides mathematicians to choose certain problems. This choice is essential in mathematic given that there exists no external reality against which mathematicians can decide which problems or which branches of mathematics are important (see von Neumann, 1947 [“The Mathematician”]): the choice involves human values and preference - and, indeed, these change over time, as exemplified by the dismissal of geometry by some prominent mathematicians in the early 20th century (see Whiteley, 1999). The survey of mathematicians conducted by Wells (1990) provides a more empirically-based challenge to the intrinsic view of the mathematical aesthetic. Wells obtained responses from over 80 mathematicians, who were asked to identify the most beautiful theorem from a given set of 24 theorems. (These theorems were chosen because they were ‘famous’, in the sense that Wells judged them to be well-known by most mathematicians, and of interest to the discipline in general, rather than to a particular subfield.) Wells finds that the mathematicians varied widely in their judgments. More interestingly, in explaining their choices, the mathematicians revealed a wide range of personal responses affecting their aesthetic responses to the theorems. Wells effectively puts to rest the belief that mathematicians have some kind of secret agreement on what counts as beautiful in mathematics….Burton’s (2004) work focuses on the practices of mathematicians and their understanding of those practices. Based on extensive interviews with a wide range of mathematicians…She points out that mathematicians range on a continuum from unimportant to crucial in terms of their positionings on the role of the aesthetic, with only 3 of the 43 mathematicians dismissing its importance. For example, one said “Beauty doesn’t matter. I have never seen a beautiful mathematical paper in my life” (p. 65). Another mathematician was initially dismissive about mathematical beauty but later, when speaking about the review process, said: “If it was a very elegant way of doing things, I would be inclined to forgive a lot of faults” (p. 65). Non-trivial special cases. But it depends on how “representative” one believes the special cases to be. For instance, if one can verify low-dimensional cases of a conjecture that is true in high dimensions, this is usually only weak (but not entirely insignificant) evidence, as it is possible that there exist high-dimensional pathologies that sink the conjecture but cannot be folded up into a low-dimensional situation. But if one can do all odd-dimensional cases, and all even-dimensional cases up to dimension 8 (say), then that begins to look more convincing. Proofs of parallel, analogous, or similar conjectures. Particularly if these proofs were non-trivial and led to new insights and techniques. RH in function fields is a good example here; it raises the hope of some sort of grand unified approach to GRH that somehow handles all number fields (or some other general class) simultaneously. Converse of the conjecture is provable, and looks “optimal” somehow. One might be able to construct a list of all obvious examples of objects with property X, find significant difficulty extending the list, and then conjecture that this is list is complete. This is a common way to make conjectures, but can be dangerous, as one may simply have a lack of imagination. So this is thin evidence by itself (many false conjectures have arisen from this converse-taking method), but it does carry a little bit of weight once combined with other strands of evidence. Conjecture is ambitious and powerful, and yet is not immediately sunk by the obvious consistency checks. This is vaguely analogous to the concept of a “falsifiable theory” in science. A strong conjecture could have many powerful consequences in a variety of disparate areas of mathematics - so powerful, in fact, that one would not be surprised that they could be disproven with various counterexamples. But surprisingly, when one checks the cases that one does understand quite well, the conjecture holds up. A typical example here might include a very general conjectured identity which, when specialised to various well-understood special cases, become a provable identity - but with the identity in each special case being provable by very different methods, and the connection between all the identities being mysterious other than via the conjecture. The general conjecture that the primes behave pseudorandomly after accounting for small moduli is an example of such a conjecture; we usually can’t control how the primes behave, but when we can, the pseudorandomess heuristic lines up perfectly. Attempts at disproof run into interesting obstacles. This one is a bit hard to formalise, but sometimes you can get a sense that attempts to disprove a conjecture are failing not due to one’s own lack of ability, or due to accidental contingencies, but rather due to “enemy activity”; some lurking hidden structure to the problem, corners of which emerge every time one tries to build a counterexample. The question is then whether this “enemy” is stupid enough to be outwitted by a sufficiently clever counterexample, or is powerful enough to block all such attempts. Identifying this enemy precisely is usually the key to resolving the conjecture (or transforming the conjecture into a stronger and better conjecture). Conjecture generalises to a broader conjecture that enjoys support of the types listed above. The twin prime conjecture, by itself, is difficult to support on its own; but when it comes with an asymptotic that one can then verify numerically to high accuracy and is a consequence of the much more powerful prime tuples conjecture (and more generally, the pseudorandomness heuristic for the primes) which is supported both because of its high falsifiability and also its nature as an optimal-looking converse (the only structure to the primes are the “obvious” structures), it becomes much more convincing. Another textbook example is the Poincare conjecture, which became much more convincing after being interpreted as a special case of geometrisation (which had a lot of support, e.g. the two-dimensional analogue, Haken manifolds, lots of falsifiable predictions, etc.). It can be fun (though a little risky, reputation-wise) to debate how strong various pieces of evidence really are, but one soon reaches a point of diminishing returns, as often we are limited by our own ignorance, lack of imagination, or cognitive biases. But we are at least reasonably able to perform relative comparisons of the strength of evidence of two conjectures in the same topic (I guess complexity theory is full of instances of this…). Guy: If I do any mathematics at all I think I do it in my sleep. MP: Do you think a lot of mathematicians work that way? Guy: I do. Yes. The human brain is a remarkable thing, and we are a long way from understanding how it works. For most mathematical problems, immediate thought and pencil and paper - the usual things one associates with solving mathematical problems - are just totally inadequate. You need to understand the problem, make a few symbols on paper and look at them. Most of us, as opposed to Erdős who would probably give an answer to a problem almost immediately, would then probably have to go off to bed, and, if we’re lucky, when we wake up in the morning, we would already have some insight into the problem. On those rare occasions when I have such insight, I quite often don’t know that I have it, but when I come to work on the problem again, to put pencil to paper, somehow the ideas just seem to click together, and the thing goes through. It is clear to me that my brain must have gone on, in an almost combinatorial way, checking the cases or doing an enormous number of fairly trivial arithmetical computations. It seems to know the way to go. I first noticed this with chess endgames, which are indeed finite combinatorial problems. The first indication that I was interested in combinatorics - I didn’t know I had the interest, and I didn’t even know there was such a subject as combinatorics - was that I used to compose chess endgames. I would sit up late into the night trying to analyze a position. Eventually I would sink into slumber and wake up in the morning to realize that if I had only moved the pawns over one file the whole thing would have gone through clearly. My brain must have been checking over this finite but moderately large number of possibilities during the night. I think a lot of mathematicians must work that way. MP: Have you talked to any other mathematicians about that? Guy: No. But in Jacques Hadamard’s book on invention in the mathematical field, he quotes some examples there where it is fairly clear that people do that kind of thing. There was someone earlier this week who was talking about Jean-Paul Serre. He said that if you ask Serre a question he either gives you the answer immediately, or, if he hesitates, and you push him in any way, he will say, “How can I think about the question when I don’t know the answer?” I thought that was a lovely remark. At a much lower level, one should think, “What shape should the answer be?” Then your mind can start checking whether you’re right and how to find some logical sequence to get you where you want to go. Once in my life I had a mathematical dream which proved correct. I was twenty years old. I thought, my God, this is wonderful, I won’t have to work, it will all come in dreams! But it never happened again. The first author must state that his coauthor and close friend, Tom Trobaugh, quite intelligent, singularly original, and inordinately generous, killed himself consequent to endogenous depression. 94 days later, in my dream, Tom’s simulacrum remarked, “The direct limit characterization of perfect complexes shows that they extend, just as one extends a coherent sheaf.” Awaking with a start, I knew this idea had to be wrong, since some perfect complexes have a non-vanishing K0 obstruction to extension. I had worked on this problem for 3 years, and saw this approach to be hopeless. But Tom’s simulacrum had been so insistent, I knew he wouldn’t let me sleep undisturbed until I had worked out the argument and could point to the gap. This work quickly led to the key results of this paper. To Tom, I could have explained why he must be listed as a coauthor. Let us come to mathematicians. One of them, Maillet, started a first inquiry as to their methods of work. One famous question, in particular, was already raised by him that of the “mathematical dream”, it having been suggested often that the solution of problems that have defied investigation may appear in dreams. Though not asserting the absolute non-existence of “mathematical dreams”, Maillet’s inquiry shows that they cannot be considered as having a serious significance. Only one remarkable observation is reported by the prominent American mathematician, Leonard Eugene Dickson, who can positively assert its accuracy…Except for that very curious case, most of the 69 correspondents who answered Maillet on that question never experienced any mathematical dream (I never did) or, in that line, dreamed of wholly absurd things, or were unable to state precisely the question they happened to dream of. 5 dreamed of quite naive arguments. There is one more positive answer; but it is difficult to take account of it, as its author remains anonymous. Anecdotal evidence suggests that as many as a third of all papers published in mathematical journals contain mistakes - not just minor errors, but incorrect theorems and proofs…My information about mathematicians’ errors and embarrassment comes mainly from George Bergman. Some twenty years ago, I decided to write a proof of the Schroeder-Bernstein theorem for an introductory mathematics class. The simplest proof I could find was in Kelley’s classic general topology text [4, page 28]. Since Kelley was writing for a more sophisticated audience, I had to add a great deal of explanation to his half-page proof. I had written five pages when I realized that Kelley’s proof was wrong. Recently, I wanted to illustrate a lecture on my proof style with a convincing incorrect proof, so I turned to Kelley. I could find nothing wrong with his proof; it seemed obviously correct! Reading and rereading the proof convinced me that either my memory had failed, or else I was very stupid twenty years ago. Still, Kelley’s proof was short and would serve as a nice example, so I started rewriting it as a structured proof. Within minutes, I rediscovered the error. My interest in proofs stems from writing correctness proofs of algorithms. These proofs are seldom deep, but usually have considerable detail. Structured proofs provided a way of coping with this detail. The style was first applied to proofs of ordinary theorems in a paper I wrote with Martin Abadi . He had already written conventional proofs|proofs that were good enough to convince us and, presumably, the referees. Rewriting the proofs in a structured style, we discovered that almost every one had serious mistakes, though the theorems were correct. Any hope that incorrect proofs might not lead to incorrect theorems was destroyed in our next collaboration . Time and again, we would make a conjecture and write a proof sketch on the blackboard - a sketch that could easily have been turned into a convincing conventional proof - only to discover, by trying to write a structured proof, that the conjecture was false. Since then, I have never believed a result without a careful, structured proof. My skepticism has helped avoid numerous errors. I tried typing up the proof that I’d hand-written, and in the process, I think I’ve found the fundamental error. . . I now really begin to understand what you mean about the power of this method, even if it did take me hours to get to this point! It is instructive that, to find the error, he had to re-write his proof to be read by someone else. Eliminating errors requires care. Twenty years ago it was reasonable to predict that the size and ambition of software products would be severely limited by the unreliability of their component programs. Crude estimates suggest that professionally written programs delivered to the customer can contain between one and ten independently correctable errors per thousand lines of code; and any software error in principle can have spectacular effect (or worse: a subtly misleading effect) on the behaviour of the entire system. Dire warnings have been issued..The arguments were sufficiently persuasive to trigger a significant research effort devoted to the problem of program correctness. A proportion of this research was based on the ideal of certainty achieved by mathematical proof. Fortunately, the problem of program correctness has turned out to be far less serious than predicted. A recent analysis by Mackenzie has shown that of several thousand deaths so far reliably attributed to dependence on computers, only ten or so can be explained by errors in the software: most of these were due to a couple of instances of incorrect dosage calculations in the treatment of cancer by radiation. Similarly predictions of collapse of software due to size have been falsified by continuous operation of real-time software systems now measured in tens of millions of lines of code, and subjected to thousands of updates per year…And aircraft, both civil and military, are now flying with the aid of software measured in millions of lines - though not all of it is safety-critical. Compilers and operating systems of a similar size now number their satisfied customers in millions. So the questions arise: why have twenty years of pessimistic predictions been falsified? Was it due to successful application of the results of the research which was motivated by the predictions? How could that be, when clearly little software has ever has been subjected to the rigours of formal proof? Success in the use of mathematics for specification, design and code reviews does not require strict formalisation of all the proofs. Informal reasoning among those who are fluent in the idioms of mathematics is extremely efficient, and remarkably reliable. It is not immune from failure; for example simple misprints can be surprisingly hard to detect by eye. Fortunately, these are exactly the kind of error that can be removed by early tests. More formal calculation can be reserved for the most crucial issues, such as interrupts and recovery procedures, where bugs would be most dangerous, expensive, and most difficult to diagnose by tests…Many more tests should be designed than there will ever be time to conduct; they should be generated as directly as possible from the specification, preferably automatically by computer program. Random selection at the last minute will protect against the danger that under pressure of time the program will be adapted to pass the tests rather than meeting the rest of its specification. There is some evidence that early attention to a comprehensive and rigorous test strategy can improve reliability of a delivered product, even when at the last minute there was no time to conduct the tests before delivery! There is a lovely but probably apocryphal anecdote about Norbert Weiner. Teaching a class at MIT, he wrote something on the blackboard and said it was ‘obvious.’ One student had the temerity to ask for a proof. Weiner started pacing back and forth, staring at what he had written on the board and saying nothing. Finally, he left the room, walked to his office, closed the door, and worked. After a long absence he returned to the classroom. ‘It is obvious’, he told the class, and continued his lecture. Social pressure often hides mistakes in proofs. In a seminar lecture, for example, when a mathematician is proving a theorem, it is technically possible to interrupt the speaker in order to ask for more explanation of the argument. Sometimes the details will be forthcoming. Other times the response will be that it’s “obvious” or “clear” or “follows easily from previous results.” Occasionally speakers respond to a question from the audience with a look that conveys the message that the questioner is an idiot. That’s why most mathematicians sit quietly through seminars, understanding very little after the introductory remarks, and applauding politely at the end of a mostly wasted hour. It is true that Lagrange never did publish it, so he must have realized there was something wrong. In another version of the story, told by Jean-Baptiste Biot, who claims to have been there (though the minutes do not list his name), everybody there could see that something was wrong, so Lagrange’s talk was followed by a moment of complete silence [2, p. 84]. Still, Lagrange kept the manuscript with his papers for posterity to read. Why work on it at all? The historical focus on the fifth postulate came because it felt more like the kind of thing that gets proved. It is not self-evident, it requires a diagram even to explain, so it might have seemed more as though it should be a theorem. In any case, there is a tradition of attempted proofs throughout the Greek and then Islamic and then eighteenth-century mathematical worlds. Lagrange follows many eighteenth-century mathematicians in seeing the lack of a proof of the fifth postulate as a serious defect in Euclid’s Elements. But Lagrange’s criticism of the postulate in his manuscript is unusual. He said that the assumptions of geometry should be demonstrable “just by the principle of contradiction”-the same way, he said, that we know the axiom that the whole is greater than the part [32, p. 30R]. The theory of parallels rests on something that is not self-evident, he believed, and he wanted to do something about this. What was the strange and alien to the modern mind approach that Lagrange used? …Why did philosophers conclude that space had to be infinite, homogeneous, and the same in all directions? Effectively, because of the principle of sufficient reason. For instance, Giordano Bruno in 1600 argued that the universe must be infinite because there is no reason to stop at any point; the existence of an infinity of worlds is no less reasonable than the existence of a finite number of them. Descartes used similar reasoning in his Principles of Philosophy: “We recognize that this world. . . has no limits in its extension. . . . Wherever we imagine such limits, we . . . imagine beyond them some indefinitely extended space” [28, p. 104]. Similar arguments were used by other seventeenth-century authors, including Newton. Descartes identified space and the extension of matter, so geometry was, for him, about real physical space. But geometric space, for Descartes, had to be Euclidean…Descartes, some 50 years before Newton published his first law of motion, was a co-discoverer of what we call linear inertia: that in the absence of external influences a moving body goes in a straight line at a constant speed. Descartes called this the first law of nature, and for him, this law follows from what we now recognize as the principle of sufficient reason. Descartes said, “Nor is there any reason to think that, if [a part of matter] moves. . . and is not impeded by anything, it should ever by itself cease to move with the same force” [30, p. 75]….Leibniz, by contrast, did not believe in absolute space. He not only said that spatial relations were just the relations between bodies, he used the principle of sufficient reason to show this. If there were absolute space, there would have to be a reason to explain why two objects would be related in one way if East is in one direction and West in the opposite direction, and related in another way if East and West were reversed [24, p. 147]. Surely, said Leibniz, the relation between two objects is just one thing! But Leibniz did use arguments about symmetry and sufficient reason-sufficient reason was his principle, after all. Thus, although Descartes and Leibniz did not believe in empty absolute space and Newton did, they all agreed that what I am calling the Euclidean properties of space are essential to physics. …In his 1748 essay “Reflections on Space and Time”, Euler argued that space must be real; it cannot be just the relations between bodies as the Leibnizians claim . This is because of the principles of mechanics - that is, Newton’s first and second laws. These laws are beyond doubt, because of the “marvelous” agreement they have with the observed motions of bodies. The inertia of a single body, Euler said, cannot possibly depend on the behavior of other bodies. The conservation of uniform motion in the same direction makes sense, he said, only if measured with respect to immovable space, not to various other bodies. And space is not in our minds, said Euler; how can physics-real physics-depend on something in our minds?…in his Critique of Pure Reason of 1781, Kant placed space in the mind nonetheless. We order our perceptions in space, but space itself is in the mind, an intuition of the intellect. Nevertheless, Kant’s space turned out to be Euclidean too. Kant argued that we need the intuition of space to prove theorems in geometry. This is because it is in space that we make the constructions necessary to prove theorems. And what theorem did Kant use as an example? The sum of the angles of a triangle is equal to two right angles, a result whose proof requires the truth of the parallel postulate [26, “Of space,” p. 423]….Lagrange himself is supposed to have said that spherical trigonometry does not need Euclid’s parallel postulate [4, pp. 52-53]. But the surface of a sphere, in the eighteenth-century view, is not non-Euclidean; it exists in 3-dimensional Euclidean space [20, p. 71]. The example of the sphere helps us see that the eighteenth-century discussion of the parallel postulate’s relationship to the other postulates is not really about what is logically possible, but about what is true of real space. Delete all of chapter 3 on NP. Delete all of chapter 5 on the polynomial hierarchy. Delete most of chapter 6 on circuits. Delete all of chapter 7 on probabilistic computation. Mark as dangerous chapter 9 on cryptography. Delete most of chapter 10 on quantum computation - who would care about Shor’s algorithm then? Delete all of chapter 11 on the PCP theorem. I will stop here. Most of the initial part of the book is gone. The same for much of Homer-Selman, and basically all of the “Reducibility and Completeness” CRC chapter.